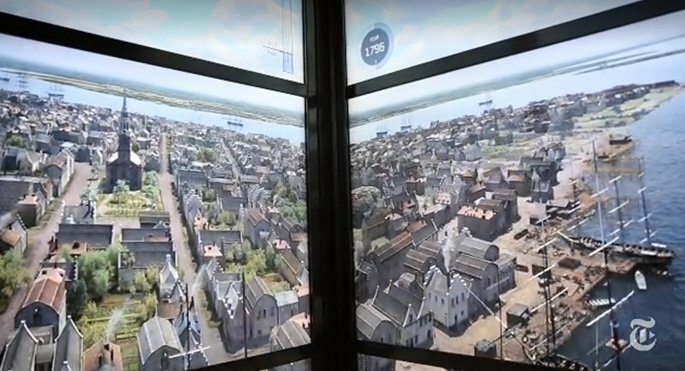 Tourists and die-hard New Yorkers who plan on shelling out $32 to take in the vistas from the One World Trade Center observation deck will also get the unique experience of taking in the city’s skyline through the last 515 years. The Times reports that the five elevators servicing the building’s 102nd-floor observatory will be equipped with three wrapping, high-tech monitors that will display a time-lapse view of Lower Manhattan as its takes its patrons on a 47-second, 23 mph ride to the top. The screens will project everything from Manhattan’s start as a verdant, marshy wonder to its rise as the world’s capital in all its sky-scraping glory. But, most notably, the ride will highlight the south WTC tower brought down by terrorists on 9/11. The choice to include 9/11 was one that could not be avoided, and unsurprisingly elicited many “strong opinions and emotional reactions” amongst planners. But it was concluded that it would not be ignored, particularly as the south tower was the site of the original observatory. Those wanting to experience the tribute will be able to do so starting May 29th, when the observatory officially opens to the public.